The Tokyoflash Gridlock is the latest design concept to spring from the minds, pens and graphics software from this dare-to-be-different, Shibuya-based watch company. Some of the Tokyoflash watches can be extremely difficult to actually read. Its company motto, “Change The Way You Think About Time”, and sometimes you really do have to think a lot about the time before you can tell the time. But the Gridlock, it’s not too bad, not too difficult.. 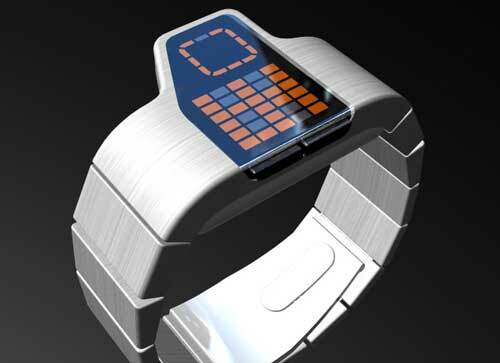 The watch band has a slightly futuristic slant, but the material is brushed metal, pretty classic, pretty standard. But the watchface is where the different really happens here. It’s not square, it’s not round. It’s rectangular with a trapezium-shaped extension. It looks a little like the top-down view of a hotel swimming pool. 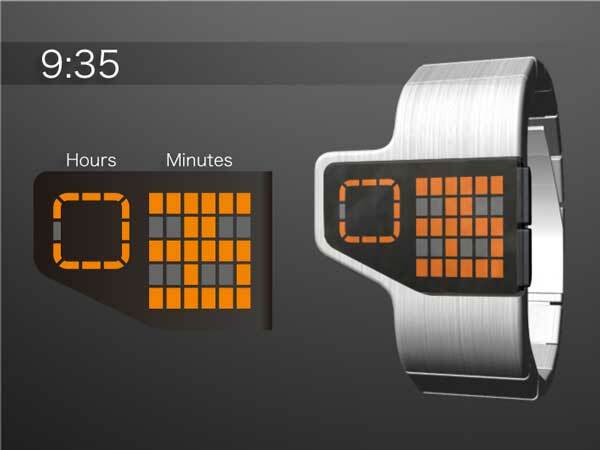 This double-decker geometrical watchface houses two time indicators. One the left, is the part of the face that gives you the hour. There’s no numbers, but it neatly mimics a standard watchface, but instead of numbers, there are dashes, or cells in the same place as the numbers 1 to 12 on a regular watch. The hour is marked by the grey cell, in amongst all the orange-lit cells. On the right, the bigger of the two displays,is again what could be considered a traditional look. All the orange cells combine to form the numbers. Actually, this is the part of reading the time that took me a while to decipher. I try not to read the Tokyoflash explanation of how to to read the time on its watches. So what should have been the more obvious took me a little longer to decode. I think it’s because the left and right numbers are fused together, perhaps if there was a little padding, a gap between the two numbers, it would jump out a little more. But then, it is the Tokyoflash way to have you work harder to read the time. Just in case my words didn’t unlock the code of telling the time on the Tokyoflash Gridlock for you, below is a picture to decode the time-telling process. And if you’d like to make a comment on the design of the Gridlock watch, head on over to the Tokyoflash blog.